For the first time in decades, more manufacturing jobs are returning to the United States than are going offshore, but California, the most populous state in the Union, is struggling to compete for its share. Recently the Reshoring Initiative, based out of Kildeer Illinois, updated their cumulative numbers of reported reshored jobs since 2010 to include the year 2016. While the country continues to benefit from a substantial amount of companies finding fertile ground back in the U.S., California only gained 1.6 percent of the total share. Specifically we attracted 5,229 jobs of the total 325,996*. On a per capita basis, we attracted only 138.2 per 1 million people when the rest of the country reshored 1,165.3 per one million. On a positive note, our percentage is up a bit from 1.1 percent in last year's 2013-2015 report. You’ll find the data in charts #8 and #9 at their report here. *This is the reported number. The Initiative uses a formula for the larger total number in the narrative, which is 338,000. That would likely bring California’s percentage lower. ** This blog has been updated since it posted to reflect a mistake in the data time period. It was from 2013 to 2016, not 2010 to 2016. Also posted a chart. Site Selection magazine released their Governor’s Cup edition this week. It reflects yearly capital investment project totals and awards a state for most projects and most projects per capita. Nebraska Gov. Pete Ricketts joins the elite club of governors to claim a Site Selection Governor’s Cup, by virtue of his state winning the Cup for most capital investment projects per capita (101 such projects for 2016 = 53.7 per 1 million people). Texas Gov. Greg Abbott claims his third Governor’s Cup for total qualified projects (642), and the State’s fifth consecutive such Cup. Texas’ winning streak began in 2009. Rounding out the top five in this category are Illinois, North Carolina (289) and Georgia (271). California ranked in the top 10 of total projects at 250 but only attracted 6.4 projects per 1 million people. We at CMTA have purchased the underlying data so we can report at a later date on the number of specific manufacturing investments per capita vs. the rest of the country. You can read Site Selection Magazine's report HERE. The Governor’s Office of Business and Economic Development (GO-Biz) is now accepting applications for the California Competes Tax Credit (CCTC). There are $100 million in tax credits available during this application period for businesses that are expanding and adding full-time jobs in the state. The deadline to submit applications is Monday, January 23, 2017, at 11:59 p.m. (Pacific Time) and the online application website will automatically close once this deadline has passed. Contact Rob Sanger, 916-498-3334, for details about this and other California-focused incentive programs. Even if you are not hiring new employees, but you are investing in new equipment or other capital improvements, your company may still qualify. Dr. Harry Moser and the Reshoring Initiative are working to bring good, well-paying manufacturing jobs back to the United States by assisting companies to more accurately assess their total cost of offshoring, and shift collective thinking from "offshoring is cheaper" to "local reduces the total cost of ownership". Acccording to Moser, most companies make sourcing decisions based solely on price, oftentimes resulting in a 20 to 30 percent miscalculation of actual offshoring costs. HIs Total Cost of Ownership (TCO) Estimator helps companies account for all relevant factors — overhead, balance sheet, risks, corporate strategy and other external and internal business considerations. Using this information companies are coming back to the U.S. and reshoring their facilities, for which our country's middle class benefits tremendously. 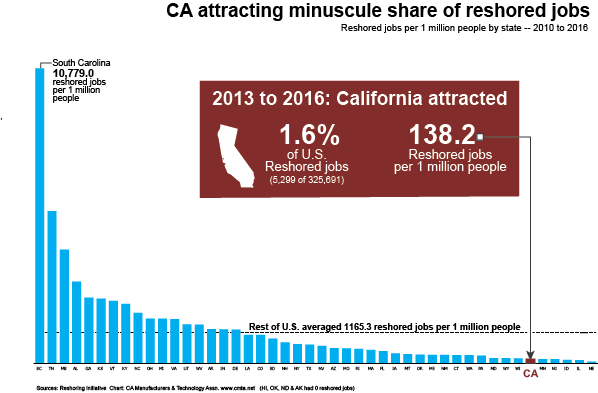 Unfortunately a look at the Reshoring Initiative's regional reshoring data since the recession shows that California has been unable to keep pace with the country and attract an amount of jobs commensurate with the state's size and manufacturing prowess. Even with our proximity to markets we are losing out to other states that can provide lower costs and predicability. 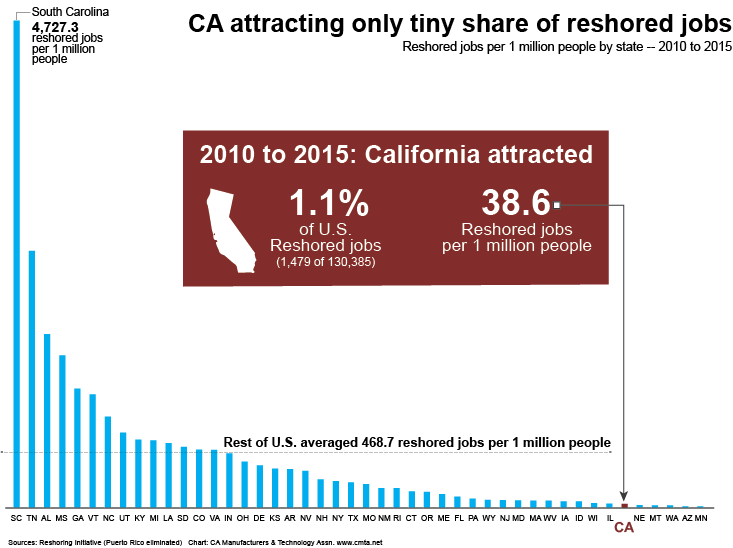 With only one percent of the reshored jobs, California should work to take advantage of the reshoring phenomenon for our middle class and economy. California's jobs report this week showed a loss of 3,400 jobs in August, indicating a continued industrial growth lag in California. 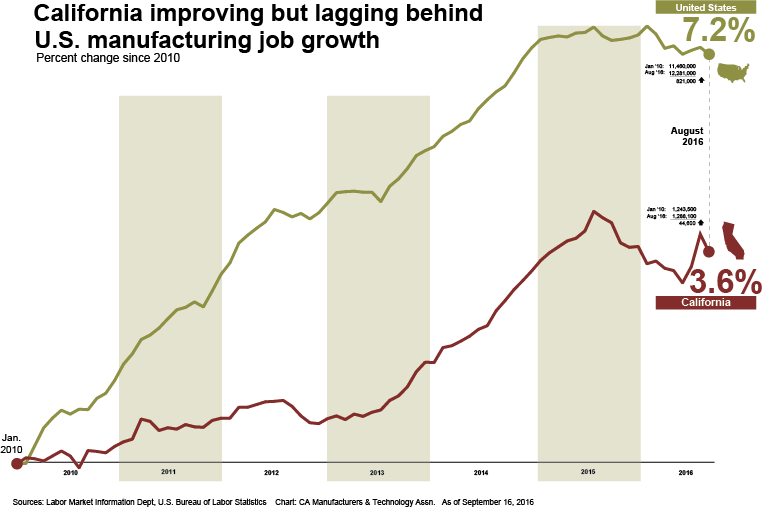 Since the recession the country's manufacturing job base grew by 7.2 percent while California grew by only 3.6 percent. Here's a look at some specific regional and industrial states: Indiana up 17.3 percent, Michigan up 33.3 percent, North Carolina up 6.7 percent, Arizona up 7.5 percent, Oregon up 13.2 percent, Nevada up 10.7 percent.